I’ve only dyed yarn once before. It for the Harry Potter Knitting House Cup Challenge (yes, I am that kind of nerd) and the class I was “taking” was Herbology. So I dyed yarn using eucalyptus leaves. It made my house smell great! I used the yarn for a crazy teapot cozy (probably the ugliest project I’ve ever knitted, no joke), and promptly never dyed yarn again. Until, that is, just a few days ago. I had my rubber arm twisted by a new knitter friend, Rebecca. 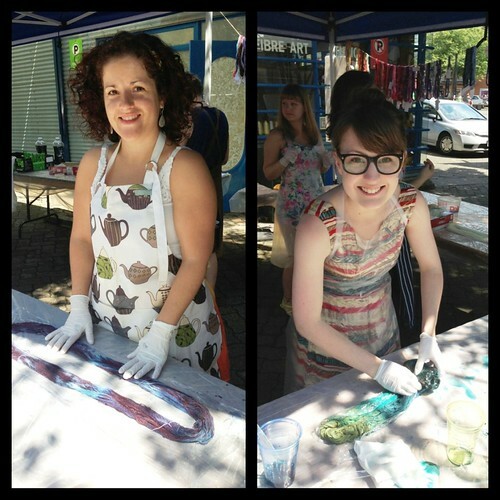 There was yarn dyeing offered during Canada Day celebrations at the Fibre Art Studio on Granville Island. We found out about it through Ravelry and signed ourselves up for 10:30am – nice and early to escape the crowds & heat! They prepared skeins of sock yarn, pre-soaked and ready to dye. 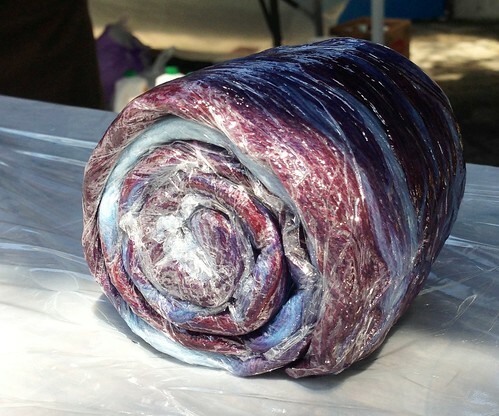 We showed up, buy the prepared skein(s) of sock yarn (75 or 100 gram skeins), and hand-painted them with dyes. They steamed the yarn for us to fix the dyes. We picked up your own sock yarn one hour later. Honestly, the organization made this the easiest yarn dying experience ever! The staff & volunteers were great, and it was a lot of fun. I felt a bit out of my element as I’m not predominantly a dyer, so I just played like a kid with finger paints and winged it. It was tough to get a good photo of the colours. I have to say, its rather tie-dyed looking but I’m fairly happy with it. It will be interesting to see how it knits up! It will likely be a pair of socks for me (goodness knows that I have a lots of sock patterns queued on Ravelry!) It is 75 grams of yarny goodness. I suppose I’ll have to update my stash now! You are currently reading Getting my Dye On at When Gaia Smiles.